Kurinjimala Sanctuary covers an area of Idukki district as well as Vattavada and Kottakamboor villages in Devikulam Taluk. The declaration of the sanctuary was made by the Kerala Forest Minister Benoy Viswam at the Neelakurinji Fest at Munnar on October 7, 2006. Kurinjimala Sanctuary protects the approximately 32 sq.km core habitat of the endangered Neelakurinji plant. It is the only Sanctuary of its kind in South India declared for the conservation of the flowering shrub Nilakurinji (Strobilanthus kunthianus), that blooms gregariously once in 12 years. The name of the sanctuary is derived from the word Kurinjimala, which means the mountain of Kurinji flowers. The Kurinjimala Sanctuary is famous for the Neelakurinji Plantation. Neelakurinji a blue flower that grows in abundance in the Idduki and Munnar region. Much of the Sanctuary is gifted with high altitude sholas and montane grasslands. Evergreen and deciduous forests are also found in the lower altitudes. Mostly, the sanctuary is formed of grasslands interspersed with Nilakurinji and Shola forests in the Valleys. Large mammals like Elephant, Gaur, Nilgiri tahr and Sambar deer are found here. The Kurinjimala Sanctuary lies close to the other Sanctuary or National Parks including – Chinnar Wildlife Sanctuary, Indira Gandhi Wildlife Sanctuary, Eravikulam National Park, Pampadum Shola National Park and Anamudi Shola National Park. The Superior time to visit at Kurinjimala Sanctuary in the month of October. 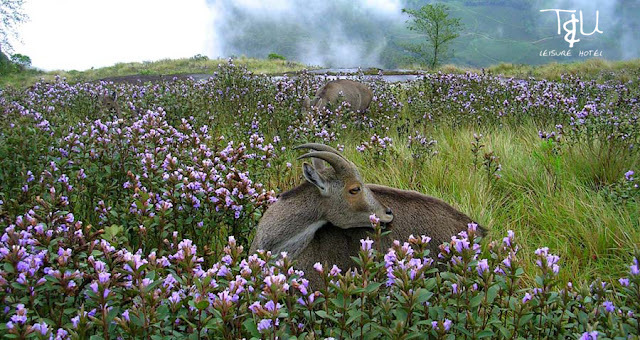 Neelakurinji fest is celebrated in the month of October by the forest department every year respectively. The Kurinjimala sanctuary is home to threatened species of elephant, Gaur, Nilgiri tahr and deer etc. The grizzled giant squirrel, Nilgiri wood-pigeon, elephant, sambar deer, gaur and pigeon can also be spotted in the sanctuary. More than 200 species of birds like the eagle, crested serpent eagle, black baza, crested goshawk, spot-bellied eagle owl, alpine swift, Grey junglefowl, Nilgiri flycatcher, little spiderhunter etc are found here. With a view to promoting awareness about the Neelakurinji shrubs, Kerala forest department organizes Neelakurinji Festival every year in the month of October. The best time to visit the park is between December and April. The Forest Department also organizes eco-tourism activities along with local tribal communities. The activities are organized to provide a means of sustainable livelihood for local communities while promoting tourism. There are no accommodation options in the sanctuary but one can stay at Munnar, 48 km from the sanctuary. There are many budgets, mid-range, luxury hotels and resorts in Munnar.